“The bottom line is no woman is going to want an abortion after seeing a sonogram.” — Francesco Angelo, medical director of the Family Planning Center in Mineola, as quoted in the New York Times. Years ago Prof. George McKenna wrote one of the best essays on abortion I’ve ever had the pleasure to read. Titled, “On Abortion: A Lincolnian Position,” McKenna’s message is, if anything, more relevant today, than it was when his essay first appeared in The Atlantic Magazine. With respect to abortion such “moral intuitions” are alive and well, tapping on the windows of souls today just as loudly and persistently as they did in the mid-19th century when slavery was legal. May I suggest that much of our job can be encapsulated in this formulation: successfully bringing to the surface the uneasiness, the moral discomfort that abortion elicits in people of good will. It’s not a question of instilling this in people; it’s already there, as the quotation from the abortion clinic operator that begins this post demonstrates. Our task is to help people recognize that this tap-tap-tapping on their hearts is not something to be ignored or repressed but acknowledged for what it is: the better angels of their nature hard at work. What I’m addressing here is the influence of everyday interactions, the kind of casual conversations that while most often are unplanned, offer rich possibilities. But before going any further, it’s very important that we’re clear about both what we don’t mean, and the target audience we are speaking about. When talking to those who are not already foot soldiers in the greatest movement for social justice of our time we don’t mean placing your principles in mothballs or minimizing your pro-life education to a quick course in Sound Bites 101. Principles are the engine that power this Movement and information is the fuel. Nor is it to suggest that what has worked can’t continue to touch the hearts and the minds of Americans. We’ve changed the contours of the debate in this nation with a multifaceted approach which is the model of effectiveness and simplicity. Please understand also that when we are speaking to those who already share our perspective, much of what follows still applies but in a different way. These people are already in the fold or merely need the tools to make them more effective. Our colleagues need information they can quickly assimilate, a local organization they can immediately join, a primer on fetal development that they can absorb in an hour or less. So the primary barrier to overcome for them is the vast range of everyday time-consuming activities that makes it difficult for people to carve out space to serve the cause of unborn babies and the medically dependent elderly. What we are talking about here is how we win over people who are not currently in our Movement. They may be curious about us, they may be even hostile without knowing why. Winning them over often is accomplished very informally or indirectly. Put another way, this is about how to soften the “soil” that may otherwise be too hard for the “seed” – – the truth about the unborn – – to take root. Given an audience of skeptics, “arguing” the case for life is in almost all circumstances a non-starter, if by that we mean that we think we can intellectually force feed, if not browbeat, people into coming our way. If you see yourself as a salesman or saleswoman, the most important thing that I’ve learned in my three decades + involvement in this Movement is that you can’t close the deal if you can’t get a foot in the door. Meaning it’s not necessarily what you or I say (especially initially), but who we are and how we present ourselves that almost always will decide whether someone will give any consideration to the first words out of our mouths. If we come across as angry know-it-alls, why would anyone want to be in our presence one nanosecond longer than he or she has to be? And what is so surprising is how often abortion or a related issue comes up. I remember like it was yesterday a time my wife and I were at the doctor’s office where Lisa was receiving medical treatment. I was reading the Washington Post when the nurse peeked over my shoulder and saw that I was working my way through an article on stem cell research and cloning. I explained that she didn’t have to choose. All the breakthroughs to date involved the use of stem cells derived from sources other than embryos (cloned or otherwise) and that, indeed, she was among the vast majority who found the idea of cloning a baby abhorrent. Lesson Three is that with the exception of hard-core pro-abortion types, you will be utterly amazed how many people are “permeable” – – that is, how few people are locked into a thought-out, well-reasoned position. They have a smidgeon of information and a “well, I think,” or “everybody knows” way of looking at the issue. Again, I’m not saying they will run over to our corner at the drop of a hat. What I am saying is that, approached respectfully, they will not run away. Ironically, I also learned that he felt deeply hurt by pro-lifers who employed the very tactics he routinely uses. Pointing out the hypocrisy would merely have caused him to put up barriers. My point is, with some exceptions, you rarely know where people are and why they have taken that position. Lesson Four is that our culture is awash in possibilities to gently, matter-of-factly, persuasively make the case for the unborn. Nowhere is that more apparent that through the conscious-raising potential of ultrasounds. They carry a powerful pro-life message: that there’s a creature in there who looks amazingly like a baby post-birth. We can and we must steep ourselves in the basics of fetal development – – the ABCs of our common developmental journey – – so that we can converse intelligently. But no words coming out of our mouths could ever match the impact of that commercial where the mom joyfully, almost reverently watches her unborn child scamper around. Whew! A final thought, one that has been brought to my attention a lot. Do not expect people who disagree with us to consider the humanity of the unborn if they are persuaded we minimize, if not dismiss altogether, their humanity. Of course the unborn child and the elderly woman in a nursing home are deserving of care and protection whether you and I make their case in a winsome way or not. But human nature doesn’t work that way. If our audience finds us or our approach unappealing, the real loser will be the defenseless human beings for whom we are trying to recruit new defenders. And as we have written dozens of times, there is no more encouraging news than the surge in pro-life sentiment among young people and young adults which shows no sign of abating. They have heard the pro-abortion mantra their entire lives and they simply aren’t buying. They know the pain, the hurt, the disillusionment that so often accompanies an abortion. 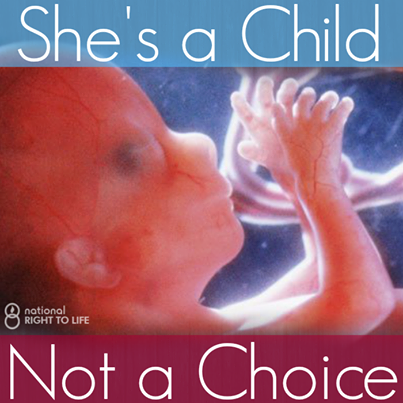 They can’t be snowed: abortion kills babies and hurts women. They have friends who have aborted and deeply regret it. And it is the innate idealism of youth that compels them to challenge a self-centered, inverted mentality, the kind that says women and men first, children last. Appeal to that idealism. It will win them over and they will carry the day.